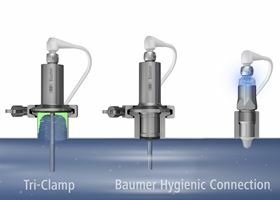 Baumer’s hygienic sensors for the food processing industry. Designer and manufacturer of sensors for the food industry, Baumer, has developed sensors which can detect different media and so avoid spillage and increase sustainability in the food industry. Sensors are playing an increasingly important role within the food processing industry, which must ensure equipment efficiency and meet strict food safety regulations. Food safety depends on hygienic design and the duration and intensity of the cleaning cycle. Baumer has more than 25 years’ experience of designing sensors for the food industry and offers sensor technologies for demanding hygienic areas, wet areas, dry areas and packaging machine operations. A long- time partner with the dairy industry, Baumer offers dairy industry specific sensors which have been designed and developed in collaboration with major manufacturers in the industry. The flush mounted sensors have no collection pockets, so they can be easily cleaned to minimise bacteria growth and contribute to optimised CIP performance. They are also designed to operate with faster cleaning cycles using less water and chemicals. Baumer has improved sensor accuracy and response times to help operators achieve tighter production control.